Lock in a great price for Holiday Inn Express Manchester - Salford Quays – rated 8.8 by recent guests! Location. Near to where I needed to be the next day. Nice area to walk about and felt safe at night. All the basic requirements in the room. Friendly staff. I love the hospitality of your staff.. they are so warm, taking away the chilly winter in Manchester. Very nice room and we got everything we requested. The staff was extremely helpful especially Maria. Our stay would have not been as fanatastic without her advice and assistants. Holiday Inn Express Manchester - Salford Quays This rating is a reflection of how the property compares to the industry standard when it comes to price, facilities and services available. It's based on a self-evaluation by the property. Use this rating to help choose your stay! One of our top picks in Manchester.Just outside Manchester center, this Holiday Inn Express is a 20-minute walk from Manchester United Football Club. The modern hotel has a 24-hour front desk and on-site parking. The stylish and comfortable bedrooms feature Wi-Fi access and air conditioning. All rooms have a flat-screen TV and work desk, an private bathroom and some have views of Salford Quays or Old Trafford Stadium. The lively lobby bar opens onto a waterfront terrace, and offers a range of beverages, snacks and fresh coffees. Guests can start the day with an inclusive Express Start breakfast buffet, featuring cooked and continental options. 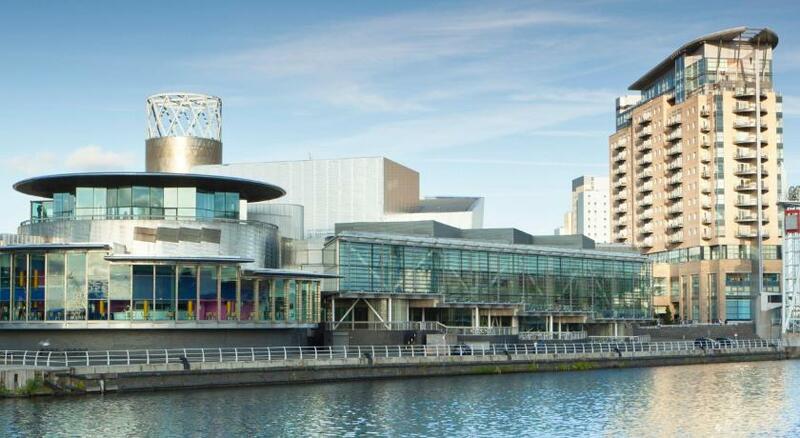 Holiday Inn Express Manchester - Salford Quays is just half a mile from The Lowry Center. Salford Quays Metrolink tram stop is a 10-minute walk away, offering services to Manchester center. Manchester Airport is 7.5 mi away. When would you like to stay at Holiday Inn Express Manchester - Salford Quays? A wheelchair accessible room suitable for up to 2 adults. This spacious room has a double bed, wider doorways, visual fire alarm and adapted bathroom facilities with roll-in shower. It also features free WiFi, a 32-inch TV with Freeview and an private bathroom with power shower. Hotel surroundings – This neighborhood is a great choice for travelers interested in soccer, convenient public transportation and friendly locals – Check location Excellent location – show map Guests loved walking around the neighborhood! House Rules Holiday Inn Express Manchester - Salford Quays takes special requests – add in the next step! Holiday Inn Express Manchester - Salford Quays accepts these cards and reserves the right to temporarily hold an amount prior to arrival. Group bookings of 5 or more rooms will not be accepted. Only guide dogs are allowed, by prior arrangement. Breakfast wasn’t that good in my opinion. The coffee was dreadful. The toast was okay. The location of the hotel was ideal for where we wanted to be. The room was perfectly adequate for our needs. Felt a bit isolated from everything else around it. Friendly helpful staff. Clean and comfortable stay breakfast tasty venue not far from attractions but view beautiful. Couldn’t fault anything or anyone. Lots of flies in the room, including a dead one squashed on the curtain! Comfy bed, staff very friendly and helpful. Friendly staff, lovely location and clean room. The scaffolding around the building was like staying on building site. Affected the views as per advertised. Nothing. It was perfect. I sent a request when I first booked to ask for a room overlooking the water. Bookings.com saud I would have to ask when I got there. I received an email the next day to say we had been allocated a room with a waterfront view. The Holiday Inn Express at Salford Quays was fantastic. Located a short walk from the Lowry theatre (The reason for our visit) it over looks the water & we watched the canoes at the the water park each morning. There was also a climbing wall at the centre. The hotel was clean & well presented. We checked in early as our room was ready. The Manager was very amenable, helping out wherever he was needed. (Great work). We saw him on reception, clearing tables in the restaruant when it was busy, in the bar. Always with a smile & a friendly word. Well done Daryle. Staff member was unhappy about us parking bike near the entrance and was rather surly about it for no reason as it wasn't blocking anything. If secure bike parking was available we wouldn't have had to source our own.